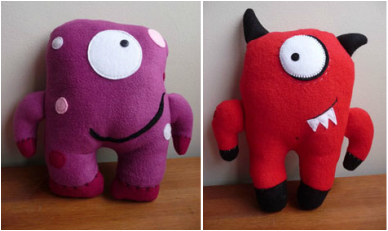 Studio Monsters range from £15 +p&p, make contact to have one custom made for you, in the style / colour of your choice. Ketchup is a cute little guy who is very sweet. 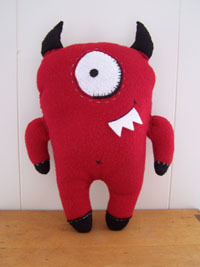 He is very devilish and loves the colour red. However, he did ask me to point out that this doesn't make him an angry monster. 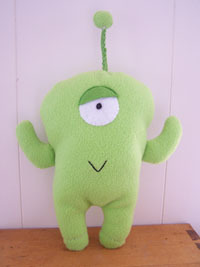 Beamer is a fun little green guy who loves to recycle and make things out of rubbish. He loves anything green and is often found helping me out in the veggie garden. Beamer is particularly fond of the garden peas - he informs me it's not just because they are his favourite shade of green, but the fact they are calm and tranquil earth forms that are at peas with the world. His words - not mine! Spotty is a little dotty, but not at all potty. 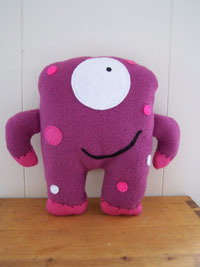 As you can see, Spotty is a one eyed monster, which is great as it's the biggest spot on him. Me and Spotty also have something in common as we both love buttons! Cookie just loves eating cookies! The more chocolaty the better! So it's just as well there's a regular supply of it at the studio. 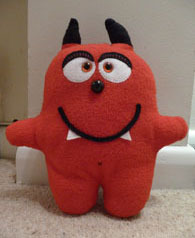 Cookie is happy mooching around and loves the company of the other monsters. 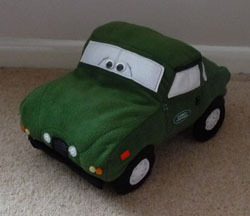 Landy is a green furry Land Rover and was specially made for Reece's 18th birthday. The monster was created from original photographs of Reece's Land Rover - which he is learning to drive in. 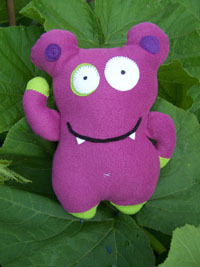 This little monster is very special and was created for Debbie (Head Greyhound Rehomer of G4U). Babes has a special little compartment attached to her back that is just the right size for a bar of chocolate - preferably Cadbury's Caramel as it's her favourite! Sweet chilli and Dotty P were adopted by Sarah (love of Sweet Chilli's life) and Robin. 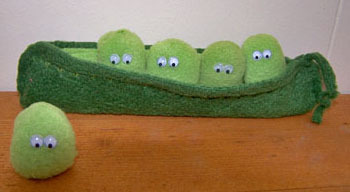 They now live in Hertfordshire, hopefully behaving themselves. Rhubarb has been adopted by Sam and lives with her in London. Sam chose the colours of Rhubarb and the studio monsters decided on his name because when he was waiting to be posted, he loved to sit in amongst the rhubarb leaves. 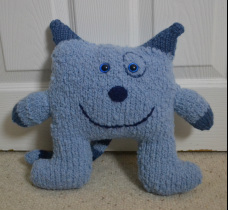 This cool cat was my first venture in knitting and resides with me with my other studio monsters. This lucky fat cat lives with the Walker family in Truro. 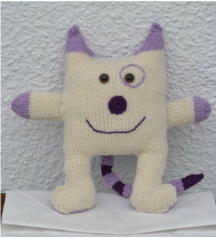 He was hand knitted if thick fluffy wool and sits comfortably on the couch.